Barnsley have completed the quadruple signings of Brighton's Jimmy McNulty, Matt Done and Scott Wiseman from Rochdale and Miles Addison from Derby. McNulty, a 26-year-old defender, joins on a two-year deal for an undisclosed five-figure fee from Brighton. 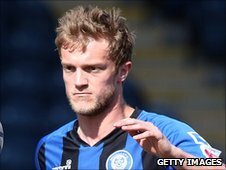 Midfielder Done, 23, and defender Wiseman, 25, have moved from Rochdale on respective two and three-year deals. Barnsley boss Keith Hill has also secured the services of utility player Addison, 22, on a six-month loan. Left-sided defender McNulty, who signed on Thursday, began his career with Everton before moving to Wrexham, Macclesfield and Stockport. He joined the Seagulls in February 2009 for £150,000 and last season played in the Championship while on loan at Scunthorpe. Done, who operates on the left but also plays behind the striker, joined the Tykes on Tuesday. Wiseman, a right-sided defender, helped Dale reach their first promotion, alongside Done, in 41 years.